It’s guest post Friday!! Today, I’m excited to have a post from My Best Friend The Money Guy. Dale shares the necessary steps to stop planning and start doing! As someone who suffers from “paralysis by analysis” this post would have been extremely helpful when we first started our debt free journey! Dale is a California native with a passion to help others conquer the personal finance game and become debt free. 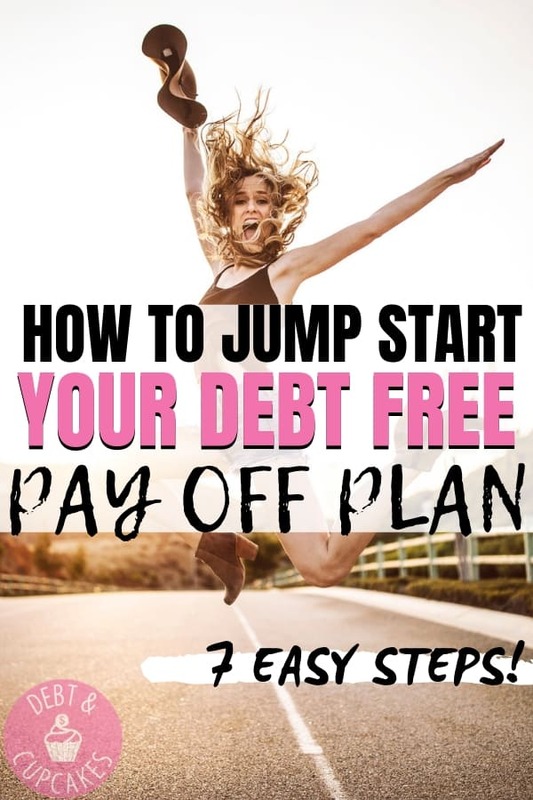 Dale is going to detail the steps needed to not only start your debt free journey, but to crush it! There’s nothing wrong with that post if it’s true, but it’s hard to relate to for most of us. You’ll also see headlines like, “Sell Your Family Heirlooms for Quick Cash!” I’m not kidding. I read an article about cashing in heirlooms to capitalize on the price of gold and how to find out the value of family antiques to make the most profit. All so she can get pennies on the dollar for her great-grandmother’s pearls and engagement ring that were meant to be passed down for generations. Budgeting is my personal finance drug of choice, but tackling debt is a close second. I’ve been trying for the last couple years to get someone, anyone that I know, to sit down with me to work on finances. I’m a regular guy with a good income, no extravagant possessions, a growing family and I had some nagging debt. Here’s the thing, I didn’t have a lot of it. We almost always had just enough that it was holding us back, but not so much that it was seen as much of a problem. My wife and I did Dave Ramsey’s Financial Peace University. It’s a good program. A lot of people try to pick it apart, but I’m not going to do that. Bottom line is that it worked for us on our path to become debt-free. I led our group as the coordinator. The group consisted of myself, my wife and a couple that we’re good friends with. We practically begged people to join us. I’m not sure if it was the price of the course, the possibility that we might find out how bad they’ve been with money, or if they just didn’t want to do the class with us, but nobody else took the leap. After we finished our 9-week course I put the call back out there for anyone who wanted, I would be happy to facilitate another session. Still no takers. I never set out to start a financial blog. I wanted to just do one on one coaching with individuals and couples to help them create a plan, get out of debt and start being happy with their financial situation. It just wasn’t happening. I needed to find a way to connect with people and help someone with their finances. Blogging fit into that realm. So, here I am sitting at my computer, picturing all those friends who want to be out of debt, but don’t know where to start, don’t believe they can do it, are embarrassed to admit it and keep putting it off. Are those people just like you? If so, you are the reason why my name is My Best Friend The Money Guy! You want to become debt-free, but there’s one more thing on Amazon that you need. You also need and deserve a long vacation, maybe an Alaskan cruise. Don’t forget, you promised yourself that you would replace your car this year. You wanted to pay down some debt this month, but it just got away from you and just didn’t work out. Hopefully things will be better next month. Maybe that’s not you. Maybe you don’t spend money on anything big, but for some reason you just can’t get ahead. Do you find yourself at Target three times a day? Debt is a serious issue in our society. Our families are in debt. Our students are in debt. Our businesses are in debt. Our nations are in debt. The United States has a national debt of $21 trillion and Canada is $600 billion in debt. In the middle of 2018 U.S. student loan debt surpassed $1.5 trillion and Americans currently carry an additional $1 trillion in credit card debt. Now that we’ve looked at some of the big numbers, let’s look at our own now. When my wife and I started the process of paying off our debt we had about $15,000 to eliminate. We owed our orthodontist, our cell phone company, the credit card company and our car lender. For many people $15,000 isn’t a lot. For us, it was much more than monthly bills, it was a symptom of a bigger problem. We were impulsive in our spending, felt entitled to things we couldn’t afford and thought we could out-earn excessive spending. We didn’t do these things in a big way, but we did them. What habits, feelings and attitudes do you have that are keeping you ensnared in debt? Once you understand the real problem behind the debt you can come up with some goals and a plan to make changes. Get on the same page with your spouse. It’s very common to have one partner that spends more freely than the other. It’s probably just as common for the other partner to resent it a little and want to spend money their way for once. I’ve observed spouses keeping score. “She spent $300 on sewing and craft supplies, so I get to buy the compound miter saw I want” All of that thinking is wrong. To compound marital money difficulties, many couples keep their finances separate. They divide bills and spend the rest the way they want. How can you expect to win as a team financially if you keep your money separate? That’s not the point. The point is to sync up with your spouse and come up with a vision together for your life and your money. Get on the same page with an accountability partner. Having an accountability partner is vital. Friends influence our money habits for the worse, but they can have the opposite effect as well. An accountability partner can be working on their own finances too, or it can be someone that has already become debt-free. Friends that are not actively working to improve their finances are not going to be of much value to you as a partner. Specific: What do you want to accomplish? Why do you want to accomplish it? What requirements or constraints are there? Measurable: How will you measure your progress? How will you know when the goal is accomplished? Achievable: How can your goal be accomplished? Is it sustainable? Relevant: Is this a worthwhile goal? Will this goal help you accomplish something greater? Time-Bound: How long will it take to achieve your goal? When will you work on it? Notice how I called it a spending plan, not a budget? …Tricked you, it’s a budget! Getting on a written budget is one of the greatest things you can do for your overall financial health. It doesn’t matter how large or small your income is; if you don’t have a plan, your money will find somewhere else to go. It will go to costly meals at restaurants, extra items in your basket at Target and to Amazon deals of the day…every day. It will disappear at craft stores, gun stores, and amusement parks. No matter how much we make, if there is no plan, we tend to spend it all and then some in the form of credit cards. If you want to get out of debt, you must follow a written budget. Budgeting is seen as being a bad word, but it’s not. Your budget isn’t restrictive. If done correctly, your budget helps you out of bad financial situations and gives you permission to spend money on the things you value. We damage our ability to make progress when we give ourselves an out by making excuses and justifying behaviors that are counterproductive. You might think that you don’t make enough money to be able to afford to pay off your debt, but that may not be true and even if it is, it should be temporary. You may justify that the cost of living is too high or that you don’t want your family to have to sacrifice. These are excuses. Rather than excuses, look for reasons to keep going. Many of us are in debt because we’re trying to keep up with the Joneses. I’ve got news for you; the Jones family is also deeply in debt. We stay in debt because we’re unwilling to sacrifice wants and luxuries. Maybe we want to go on vacation and buy nice cars. We want the biggest TVs and hottest new gaming systems. Debt will give the appearance of having those things, but we’re basically just borrowing them and paying a premium to do so. These things that we think will make us happy will all fade with time and in the process, give us the appearance of wealth without giving us the lasting promises of it. Decide now that the impulses and desires that caused you to take on debt will not control you in the future. Decide that you will sacrifice the things that are holding you back. When we decided to get out of debt, my wife and I both sacrificed. We cut down our lifestyle quite a bit. That’s not easy with four kids. Now that we’ve been out of debt for some time and we budget and cashflow everything, it doesn’t really feel like we sacrifice at all anymore. It’s just how we live. In his book, Rich Dad Poor Dad, Robert Kiyosaki discusses why the middle-class struggles. The answer is debt. He says, “The pattern of treating your home as an investment and the philosophy that a pay raise means you can buy a larger home or spend more is the foundation of today’s debt-ridden society. You’ll be on your way to making some serious progress. The only thing left to do is decide whether you’ll use the debt snowball or debt avalanche method to pay off all your debt! Our posts may contain affiliate links. These links pay us a small commission, but do not increase the price of your purchase!